Each December, several YSC staff members travel to San Antonio, Texas, for the San Antonio Breast Cancer Symposium (SABCS). We interviewed Michelle Esser, YSC’s Senior Program Manager for Research and Advocacy, about why YSC makes it a priority to attend this conference. Why is SABCS such an important conference to attend? SABCS is the world’s largest conference devoted exclusively to breast cancer. The conference focuses on research news and updates – including promising new potential treatments, less invasive or toxic treatments, managing side effects, etc. It is important for YSC to learn about updates that we should share with our constituents, and to remind doctors that breast cancer does affect young women. What does YSC do there? We divide and conquer! YSC typically has a space in the exhibit hall where staff shares information about our services and resources. Other staff meet in-person with physicians, pharmaceutical companies, researchers, and partner nonprofits. We also have staff who attend the educational sessions, and YSC often displays posters that share our work and survey data. Why did you record videos at the meeting? At 2014’s SABCS, I knew that the results of the SOFT/TEXT trials (which examined whether ovarian suppression should be used in young women diagnosed with breast cancer) were being released at SABCS and that this information could change recommendations for young women with hormone-receptor positive breast cancer. I wanted to share this information as soon as it was available, so I proposed a “reporting live from San Antonio” video. The idea expanded and we also interviewed advocates, researchers, etc. Much to our delight, the videos were well-received. At times, we are literally walking up to a researcher/doctor and asking them on-the-spot to discuss their research. This year, I was fortunate to have YSC RISE Legacy advocate Tracy Leduc working with me to create these videos. Any surprises at the meeting? Yes! Tracy and I attended an early-morning poster session and noticed a large crowd jostling to get a look at one of the posters. When we were finally close enough to see what was going on, we saw that the poster was about a potential new treatment for metastatic triple negative breast cancer. Since triple negative breast cancer disproportionately affects young women, we were very excited to see the results and learn of a Phase III clinical trial now enrolling. We are grateful Dr. Sylvia Adams took the time to speak with us. Yes. I was disappointed that there were only a couple presentations in the general session that focused on young or premenopausal women. And one headline-making presentation, “Chemotherapy Showed No Benefit Against Luminal A Breast Tumors,“ was based on older data that examined chemotherapy regimens not used today. So, while it is good information to know and discuss with your physician, I don’t know how much it will truly change practice. There were a significant number of posters pertinent to young women, but it would have been great to see at least some of these posters discussed in the general sessions. Can survivors and advocates attend? Yes. There are reduced registration prices for advocates and the Alamo Breast Cancer Foundation (ABCF) hosts nightly “Mentor Hot Topic” sessions, where doctors summarize the biggest news of the day. In addition, ABCF offers scholarships for advocates to attend SABCS. Applications and criteria can be found here. That said, this is a scientific meeting. Some background knowledge on the science of breast cancer is helpful (and required for the Alamo scholarship). A favorite session to attend? One of my favorites is the case study panels. There are two sessions in which physicians discuss their “tough” cases and seek input from a panel of prestigious doctors. The panel also includes one advocate to represent the patient perspective. (I sat on the panel in 2013 and I can tell you it is not an easy job!) The panel I attended this year included advocate Christine Benjamin of SHARE. She did an awesome job and provided one of my meeting highlights: One of the doctors said that a patient had “failed” the medication. Advocates in the audience groaned and Christine quickly stepped in with a gentle reminder that patients don’t “fail;” it is the medication that fails. Another interesting aspect of this session was that I would estimate 80% of the cases discussed pertained to young women. Check out our interview with Christine here. What is your biggest take–away from the meeting? Hope. There are a lot of super-smart, passionate people working on finding ways to better treat and hopefully cure breast cancer. Is the system perfect and is it moving as quickly as we would like? No. But, there is an energy at this meeting that is contagious and lot of physicians who care deeply for their patients. That gives me hope for the future. 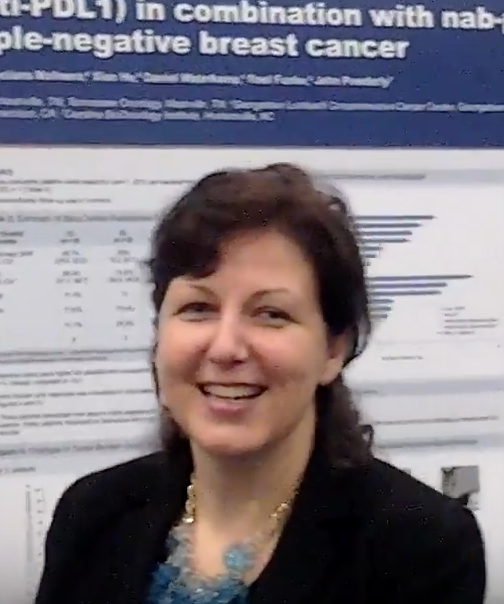 You can find all of the video updates from the 2015 SABCS here. A few of our favorites include Lisa Rezende discussing XRAYS Initiative, Dr. Matthew Goetz of the Mayo Clinic speaking with us about endocrine therapy, and Dr. Olivia Pagani on the POSITIVE Trial, which is recruiting women in early stages of breast cancer who want to stop endocrine treatment to become pregnant.